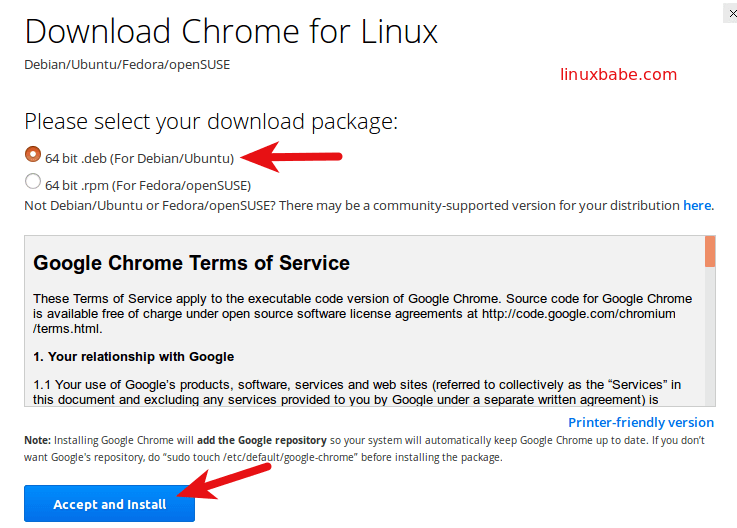 This tutorial is for Linux beginners, showing 2 ways to install Google Chrome on Ubuntu 16.04 LTS Xenial Xerus and Ubuntu 17.10. The first method uses the graphical interface; the second uses terminal commands. Please note that Google Chrome no longer provide 32 bit support for Linux from March 2016. If you are using a 32 bit version of Ubuntu, consider switching to 64 bit Ubuntu. Or you can install the 32 bit version of the open source Chromium browser using this command. Go to https://www.google.com/chrome. Click the Download Chrome button. 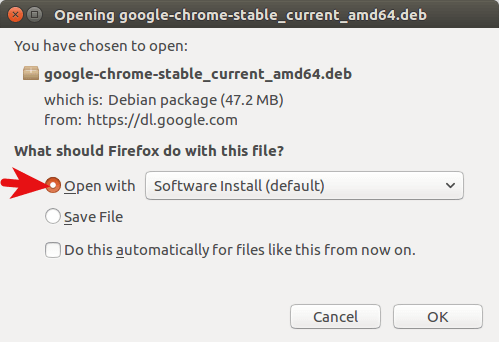 Then select the first option (64 bit .deb for Debian/Ubuntu), click Accept and Install. When Firefox asks you how to open this deb file, choose the default option to open it in Ubuntu Software (formerly Ubuntu Software Center). If you choose the first option, Google Chrome deb package will be downloaded to /tmp/mozilla_$username directory. Once the download is complete, Ubuntu Software will automatically open. 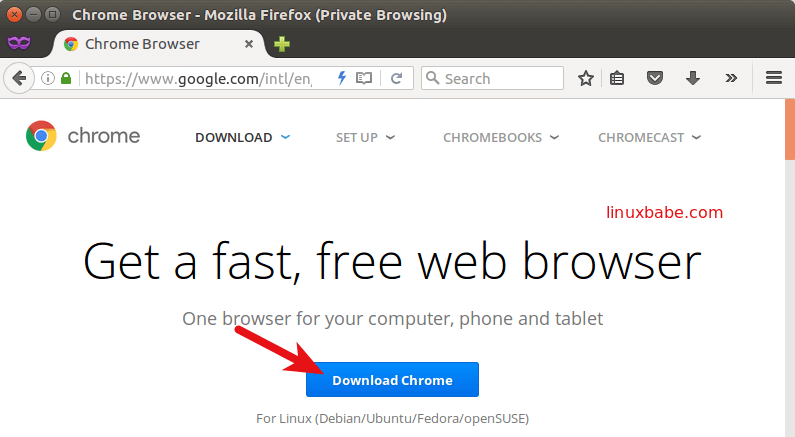 Click the Install button to install google-chrome-stable to Ubuntu 16.04/17.10. The version and installation size information can be seen in the Details section. 189.4MB of disk space! That’s huge for a Web browser. Because software installation on Linux requires root privilege, so you have to enter your password to authenticate. Once the installation is complete, you can start Chrome browser in the Unity Dash or by typing the following command in the terminal. For those of you who like to hone their command line skills, here is how to install Google Chrome on Ubuntu 16.04/17.10 using terminal. Press CTRL+ALT+T to open a terminal window, then edit sources.list file with nano text editor. You need to enter your password. Use the down arrow key to scroll to the bottom of this file. Copy the following APT line and paste it at the end of the file. To save the file in Nano text editor, press Ctrl+O, then press Enter to confirm. Next, press CTRL+X to exit out of this file. After that, enter the following command to download Google’s signing key. Then use apt-key to add it to your keyring so the package manager can verify the integrity of Google Chrome package. Now update package list and install the stable version of Google Chrome. Google Chrome browser Linux version ships with a built-in flash player called Pepper Flash installed under /opt/google/chrome/PepperFlash directory. You may see the following warning message when issuing sudo apt update command. That’s because the Google Chrome package created an APT line in file /etc/apt/sources.list.d/google-chrome.list. You can remove the warning message by deleting that file. 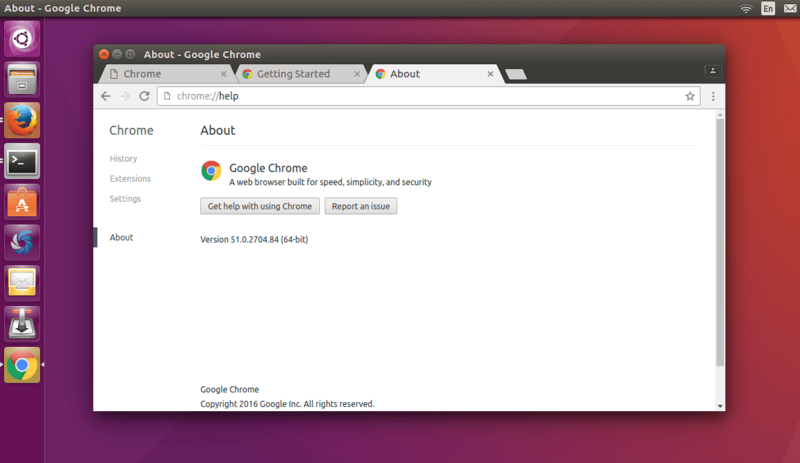 As you can see, installing Google Chrome browser on Ubuntu 16.04 is easy! As always, if you found this post useful, then subscribe to our free newsletter. You can also follow us on Google+, Twitter or like our Facebook page. I installed google chrome by command line as instructed above. When I click on google chrome nothing happens (Ubuntu 16.04) What can I do to get google chrome to work? Which desktop environment are you using? 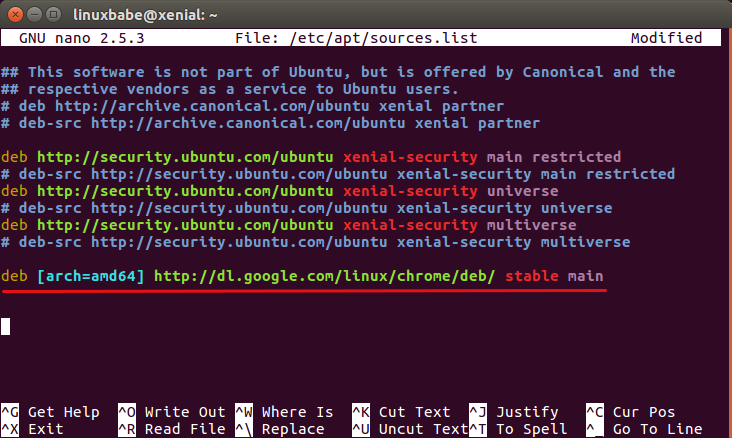 I tested the command line in Ubuntu Unity and Ubuntu Mate. Both works fine. 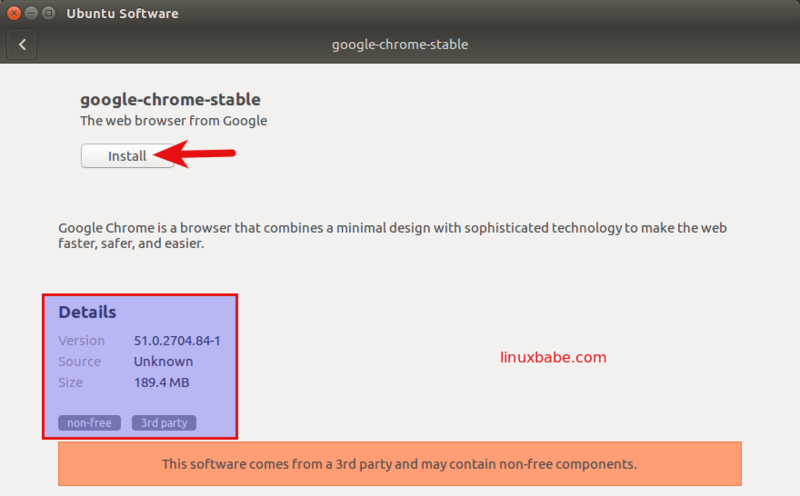 I have Ubuntu Studio (16.04.2), and I can’t get past the “E: Unable to locate package google-chrome-stable” line. Very frustrating. Which command should i use to open chrome in terminal from now on? Package google-chrome-stable is not available, but is referred to by another package. I installed chrome stable just a few minutes ago (about 3 hours after you posted). It worked perfect for me. …and it worked perfect, no error message, I’m watching Netflix on it as I type this. Hi brad. Thanks for the tip. To nicely display code, you can use HTML pre tag to wrap the code in Disqus comment system like below. I am really not having much luck. to back up, I resorted to trying to install “the command line way” because the “graphical way” also seemed to fail. but there’s no Chrome installed that I can tell. When I Search My Computer for “Chrome” I get nothing under Applications. reboot (yea, probably a useless throwback to my early Windows days) did nothing. In the meanwhile, I will try the Command Line install again, looking for where I might have slipped up. “Package google-chrome-stable is not available, but is referred to by another package. You may want to run the following command to search for Google Chrome after adding the repository. I can offer remote support via TeamViewer. If you would like to receive my support, shoot me an email. Below is a tutorial on how to install TeamViewer. not that it matters much. the World Series is over and that was really what I wanted to use Chrome to cast. Worked for me. I am using Xubuntu 17.04. Thank you for this. For some reason, I could not install it via the graphical way, had to use the terminal method. When I use the graphical method via the Software Center, it just hangs. many thanks again. Thank you, I finally upgraded my Ubuntu and Chrome was not having it. Had to go the terminal route, but it worked like a champ with your post here. Happy Me. This worked perfectly. It is exactly what I needed. Thank you for the article. i follow the above commands for installing google stable version, but when i open it, it is asking for login keyring….what to do now? 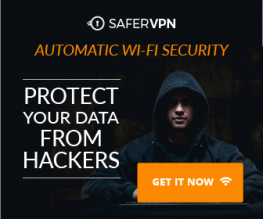 It’s because your Ubuntu system allows you to login automatically without entering password. Your user keyring won’t unlock in that case. Google Chrome is now asking you to enter your user password to unlock the keyring so it can save username and password you enter on the websites that you visit.